One of my far-away friends is going through some scary medical stuff with her mom tomorrow. I told her that I would keep my fingers and toes and eyes crossed for her that everything would turn out well. Because she's never seen a proper picture of me, she's having to imagine the colored-light silhouette in my profile picture with crossed eyes. I took this photo of my daughter two years ago. We look a lot alike so, Karen, if you imagine this picture going through one of those age-progression processes to age it by about 35 years, you'll have a good idea of what I would look like with my eyes crossed. 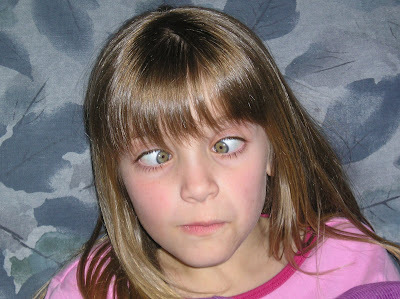 Unfortunately I can't actually do it this well--she inherited her amazing eye-crossing talent from my brother. For another one of my Wordless Wednesday photos, see my other blog. For other people's see wordlesswednesday.com. LOL love it. I tell my kids they will get them stuck that way, and they believe me, but still do it. Ahh.. the logic of young folks. I will cross some fingers for your friend too! It's true - I've seen both Child #2 and Susan's brother cross their eyes like that! Sending good thoughts Karen's way! Just a wonderful, caring friend. Thank you for this!! I crown you my official, expert cheer-me-upper! !